I just purchased your Sparkly Ring tutorial yesterday and made my first Sparkly Ring today. I could not believe how easy this ring was to make. The instructions were written out so clearly and there were so many illustrations that anyone could make this ring. This ring design is so versatile. 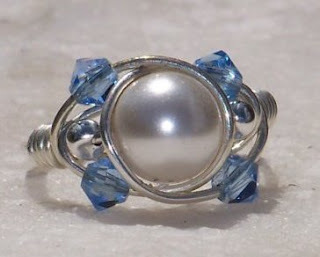 I made this, my first, with an 8mm swarovski pearl and sterling silver. I will be keeping it for myself. But there will definitely be more Sparkly Rings to come from me and it is all thanks to you and your design. 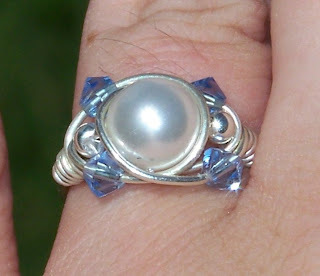 If you would like to purchase the tutorial for this ring, look to the top right hand side column of this blog. Otherwise, you can check it out at my Etsy Shop - WireBliss.